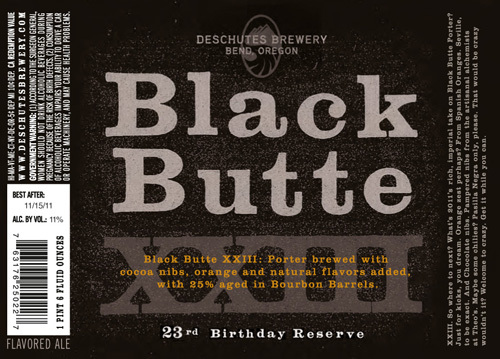 The Black Butte “Birthday Reserve” Imperial Porter is one of Deschutes Brewing’s most anticipated releases every year. It is an imperial version of their already excellent Black Butte Porter, one of my favorite porters out there. Adding to the anticipation this year, last year’s batch was cancelled when it was discovered that the chocolate nibs had not fully dissolved, leaving a floating layer of sediment (can sediment float? anyway, you get what I mean) in each of the bottles. A very small amount was available on tap at their brewpubs, but I didn’t manage to visit on the right night so I didn’t get to sample it (though I think the Professor may have managed to get a taste). As you can imagine I was pretty excited to have a chance to grab a glass when I stopped in at the Bend brewpub this weekend. I also grabbed a few bottles to stick in my cellar, as those are recommended to age for a year before they’re at optimum awesomeness. APPEARANCE: Black, very nearly opaque, with just the barest highlight of reddish brown around the edges if held directly in front of the light. HEAD: 1/4 inch of caramel colored head, slowly dissolving to just a ring around the top. LACING: Substantial lacing throughout, nearly coating the entire glass. NOSE: Roast malt, chocolate, dark caramel, touch of orange spice. TASTE: While not overly sweet, this beer could definitely serve as your dessert after a great meal. The dark roasted malt is immediately apparent, with chocolate and caramel coming through right behind. Near the end the bourbon from the barrel aging (25% of the batch) becomes apparent along with a little smokiness, tailing off with a boozy finish with a tiny bit of spice from the orange peel and chillies. MOUTHFEEL: A substantial beer with moderate carbonation, I was glad this wasn’t any heavier. Fortunately Deschutes seems to have found the right balance between keeping it light enough to enjoy while being dense enough to hold up to the powerful flavors of this porter. DRINKABILITY: I didn’t want two of these, but that’s because one glass of this heady brew was exactly right. This beer definitely rewards lingering over, as the flavors and nose continue to evolve as it warms. It’s too bad this is such a limited release, as I’ve never had a better porter. I can’t wait to see what a properly aged bottle tastes like a year from now. Four hops. Grab one if you can. Posted in Tasting Notes.Tagged 4 Hops, Black Butte XXIII, Deschutes Brewery, Imperial Porter. We opened Black Butte XXI a few weeks ago… and man, was that delicious. Glad I managed to keep myself from drinking it for so long, because it was a real treat. Now if only Deschutes had a wider distribution; we can dream. Good work hanging on to it for that long! Consider me jealous. Here’s hoping you find an XXIII somewhere! Coming to Tacoma on-tap this weekend….I can’t wait! I’ll look forward to hearing what your reaction is! Be sure to tell us in the comments whether you think my review meets with your approval. I seriously want to try this. Deschutes, get your collective asses into Illinois, pronto.